The worst part of thrift is trying to get rid of the thrift store smell in your thrifted items without washing them a million times. Thrifting is a great way to find unique and stylish pieces without dishing out a ton of cash. The downside though? The cat lady stench that is usually embedded into fabric.When I first started thrifting, I had no idea how to get rid of it of the smell or make the clothes feel soft to touch. I’d wash thrifted clothes 3-5 times on long wash cycles to no avail. Finally, I found a method that has yet to fail me. There’s so many places to thrift her in NYC but a couple of my favs are Housing Works Buy the Bag thrift( I got a ton of dope stuff for $25–you should definitely read about this AMAZING thrifting experience here). I also love L Train Vintage that has a few great locations throughout Brooklyn and Manhattan. My foolproof method to get rid of the thrift store smell in thrifted clothes, takes very little effort and a trip to the dollar store. After carefully inspecting the items one last time to see if they are even worth cleaning up, spray your clothes with white vinegar. I like to spray the vinegar vigorously all over the clothing and let it hang up in an open space or in a bag. I’ve tried this method with pure white vinegar and diluted (with water). White Vinegar helps to neutralize/ get rid of the thrift store smell a.k.a. cat lady stench, acts as a disinfectant and softeners with the fabric. Let the clothes sit overnight for best results. I usually let the hand on the shower rod. Wash the thrifted clothes based on the recommendations given on the tags of the items. If you suspect that items are made of gentle fabric, wash them in a mesh laundry bag on the gentle cycle option. You can use whatever laundry detergent you prefer but be sure to use a liquid fabric softener/conditioner as well. 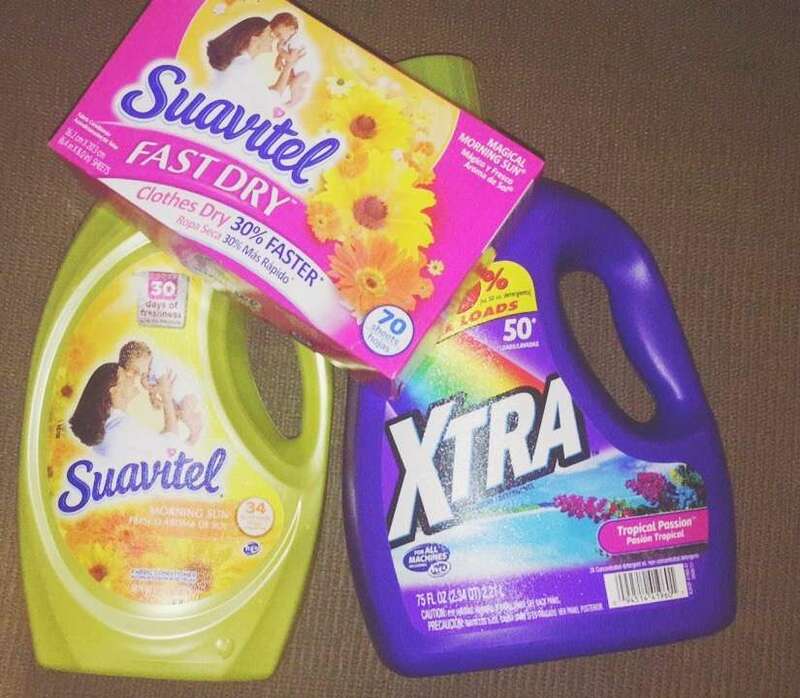 My fabric softener of choice is Suavitel. It smells AMAZING, really softens your clothes and is really cheap. FYI, if you think the thrifted clothes need to be disinfected a bit more, wash with hot water if you don’t think it would be damaging to the clothes. I totally get how that thrift store smell can turn you off from thrifting entirely. However, spending a few dollars at your local dollar store or on Amazon can totally change that. Happy Thrifting! You may also love to read about one of my favorite thrifting trips. I purchased 31 items for $25!